This fun and eclectic meeting place blurs the distinction between coffee house, music venue and restaurant/caterer. 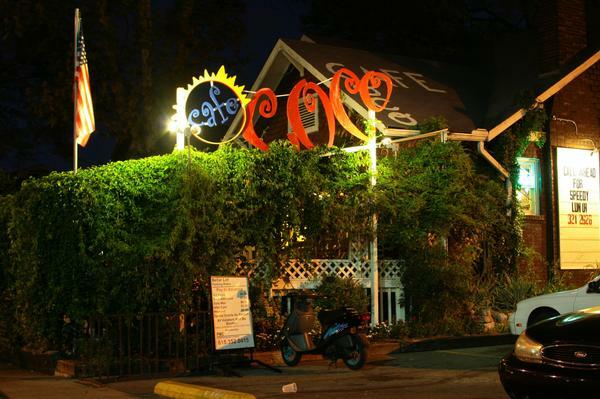 Known for its jovial atmosphere and laid back charm Café Coco is all this and much more. Tucked within Elliston Place, Music City’s “Rock Block” the tables spill out onto the covered front patio, side veranda and Back Stage Bar stretching the boundaries of this old house. Stop by in the morning for a classic New York breakfast and a cappuccino or dine all day or all night on a varied menu including personal pizzas, inspiring pastas, juicy burgers and leafy green salads then choose from the largest dessert selection in Nashville. Desserts like tiramisu, double chocolate cake, and various cheesecakes. The coffee and beer options will keep you buzzing till late. Keep up-to-date on events and more!